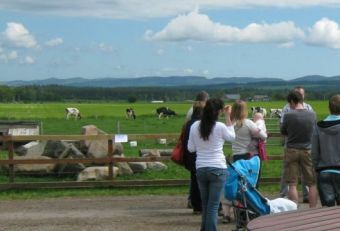 Welcome, Stewart Tower Dairy is situated in the heart of beautiful Perthshire. 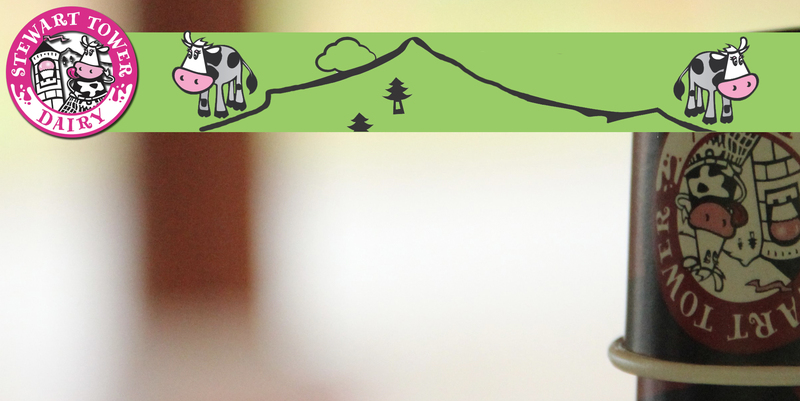 Our Holstein cows graze the green pastures of Stewart Tower Farm producing quality milk with which we make our specialist Italian Gelato-style ice cream. A wonderful menu of food served in our Round House, from salads and toasties to baked potatoes and burgers. Of course there is a full menu of ice cream sundae’s to enjoy if you have left room!! Our ice cream is made with a total commitment to quality and a genuine love for what we do. Whilst there are many products on the UK market calling themselves ice cream, not many are the genuine article. 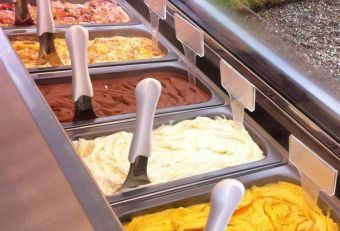 The ice cream that we produce here at Stewart Tower is made to an italian gelato-style recipe. The UK market is currently predominantly supplied with ‘hard’ American-style ice cream which tend to have a high vegetable oil content and are not as light nor as creamy in texture as gelato-style ice cream that we make. The creaminess of the ice cream we produce is a direct result of the speed with which the product is frozen. When a product is frozen quickly the ice crystals produced are much smaller, the size of these ice crystals influences how ‘grainy’ the texture of the ice cream feels on your tongue. By producing our ice cream in specialist Italian batch freezers we are able to minimise the size of the ice crystals resulting in a smooth and creamy texture. Our Cows are the backbone of our operation here at Stewart Tower. 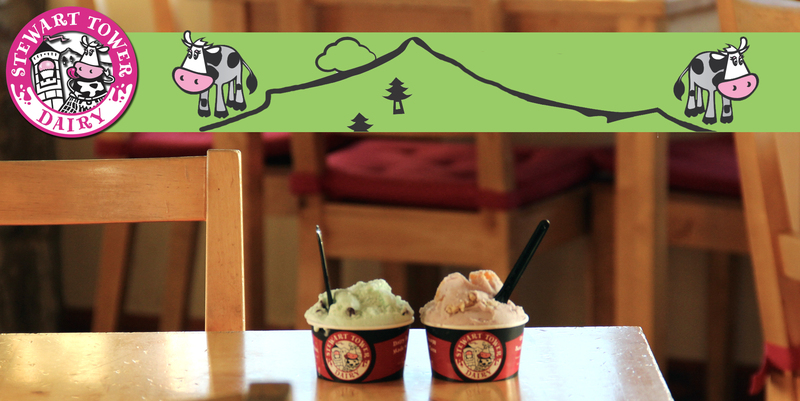 Without their fresh milk we would not have the key ingredient we need to make our ice cream. All the cows at Stewart Tower are Holstein Friesians – the majority of which are black and white. Ideally a cow will calve once a year, when a cow calves they will begin to produce milk for approximately 10 months. After 10 months of milking our cows take a 2 month holiday before beginning of the whole process again. Our cows are milked twice daily and are currently averaging around 9000 litres per cow annually. To produce this amount of milk the cows have to eat large volumes of food and water on a daily basis. The majority of the operations on the farm involve producing and preserving feed for the cows for during the colder winter months. 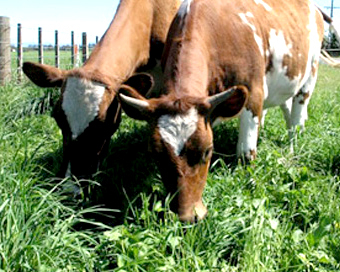 Our Cows go out to grass in early May time – only returning inside twice a day for milking and extra feeding, the rest of the time they are free to roam the luscious grass fields of Stewart Tower Farm. When the weather begins to cool around mid to late October time and the grass starts to grow at a slower rate we house our Cows inside as they prefer this. During this time they are fed a mixed diet of conserved grass, wheat and barley all of which is grown on the farm during the spring and summer months. The straw produced when growing wheat and barley is also used as bedding for the Cows to lie on in the sheds during their time indoors during the colder autumn and winter months. Our Roundhouse was originally a horse engine house and was constructed circa 1840. The Roundhouse – originally a horse engine house was constructed circa 1840 and has been lovingly restored and transformed into our coffee shop and ice cream parlour. 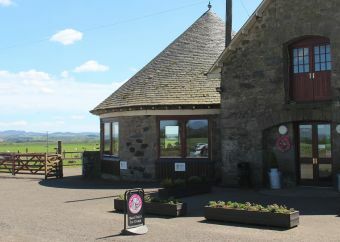 Here you can choose from a variety of light lunches, traybakes, drinks and sundaes or perhaps just a simple ice cream chosen from our cabinet of rotating flavours which can then be enjoyed sitting in, or out on our patio whilst admiring the stunning panoramic views of Perthshire that we have along with our herd of Pygmy Goats. Our menu offers a range of tasty choices covering Breakfast and Lunch. 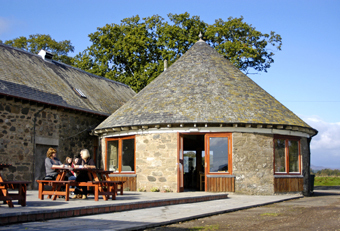 Adjoined to our roundhouse is our well stocked farmshop where we sell fresh local butcher meat, a selection of fruit and vegetables, a variety of cheeses for all occasions, cooking ingredients and a large selection of larger take home ice cream tubs thus allowing you to enjoy Stewart Tower from the comfort of your own home. In addition to this we also have a selection of Cards, Napkins and Gifts available. 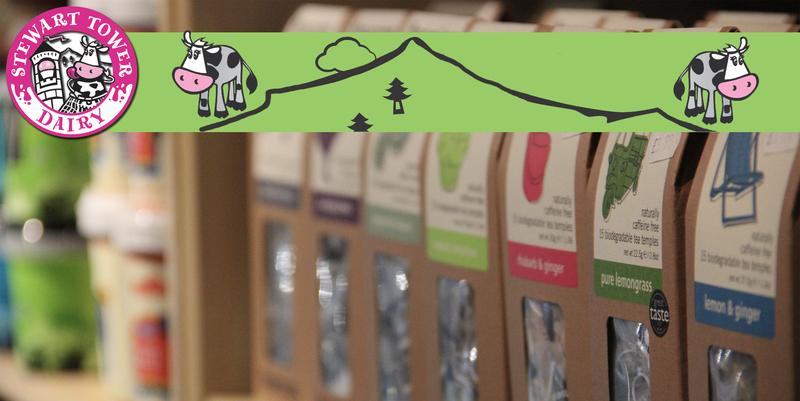 Would you like to become a Wholesaler of Stewart Tower Dairy? We would be delighted if you would like to join our growing number of wholesale outlets. If your not 100% convinced, we are happy to arrange a visit where we can talk through what we do and what your looking for and how we can work with you. We are even happy to provide training on presentation, handling and display techniques as well. Stewart Tower is located in Perthshire en route to the Highlands between Perth and Dunkeld.